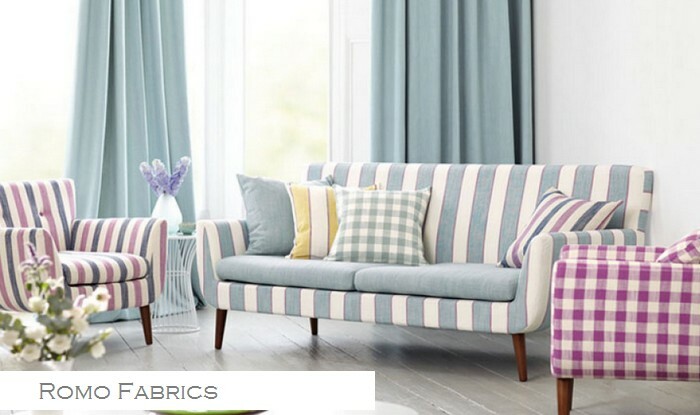 View our large range of Romo upholstery fabrics for inspiration and upholstery design ideas, each range is available in a combination of patterns and a variety of colours. 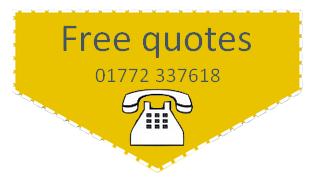 Be inspired by our collection and let us revamp or update your seating. 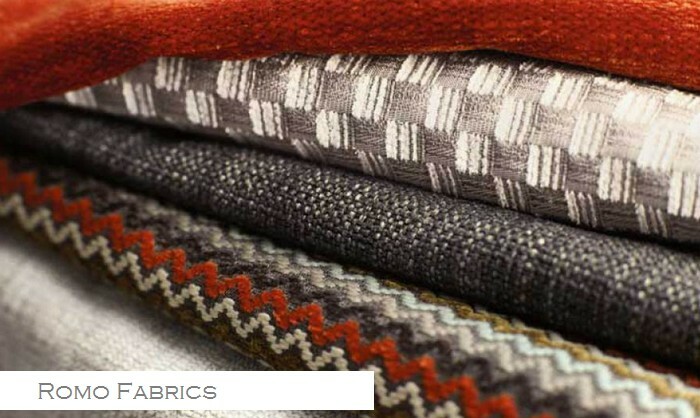 A vibrant collection of four small scale weaves in a lovely variety of earthy colours with coordinating plain weave colour ways. 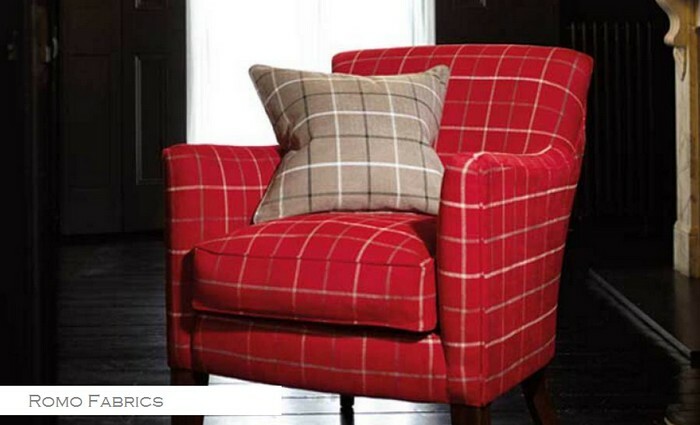 Everyones favourite with a fresh new take on classic checks and stripes, incorporating the on trend herringbone weave. 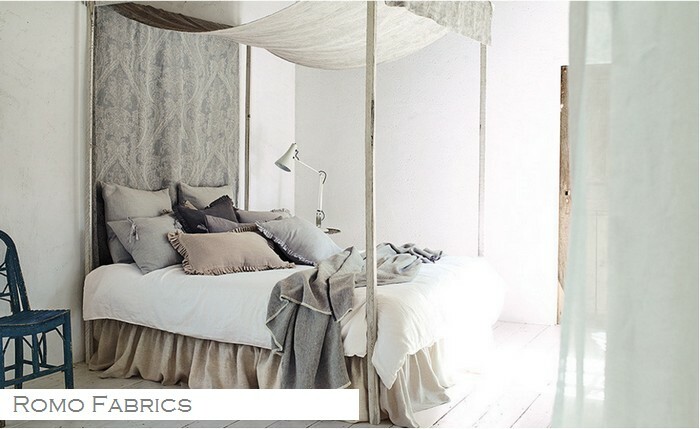 A lovely muted palette of lightweight plain linens and washable wide-width sheers. Shades of beautiful whites and creams with soft greys and Mineral colours,presented in a variety of textures and weights with a sense of simple luxury. 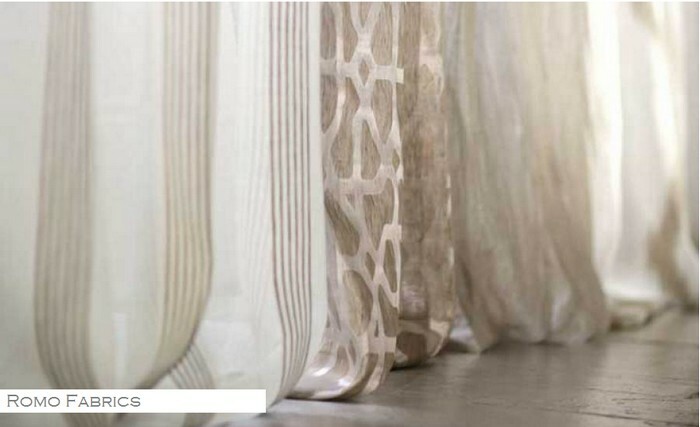 An elegant linen mix of sheers that softly diffuse light creating stylish decorative effects. 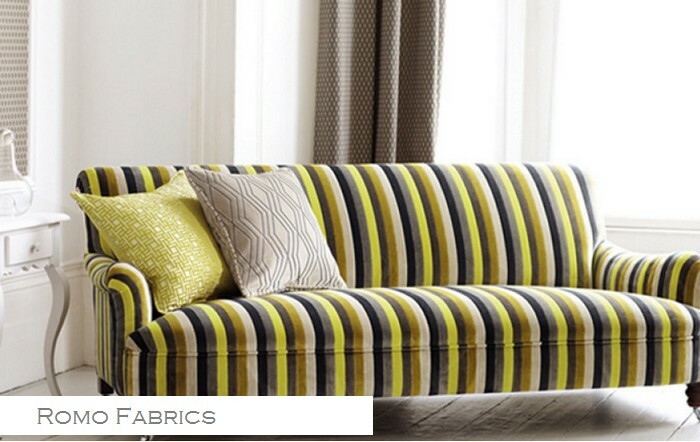 Available in a large variety of colours, stipes, plains and small patterns. A delightful selection of printed designs on Linara brushed cotton-linen, featuring contemporary geometric squares, decorative branches, Moroccan inspired designs and classic stripes. The texture has an exceptionally decadent finish and tactile quality with a beautiful soft appearance. The selection of subtle neutrals, pastel pink, forest green and sunflower yellow perfectly complement the existing Linara plain collection. Inspiring laid back living, the Damaris collection provides a subtle use of design and textures, creating an oasis of calm with a sense of subtle luxury. 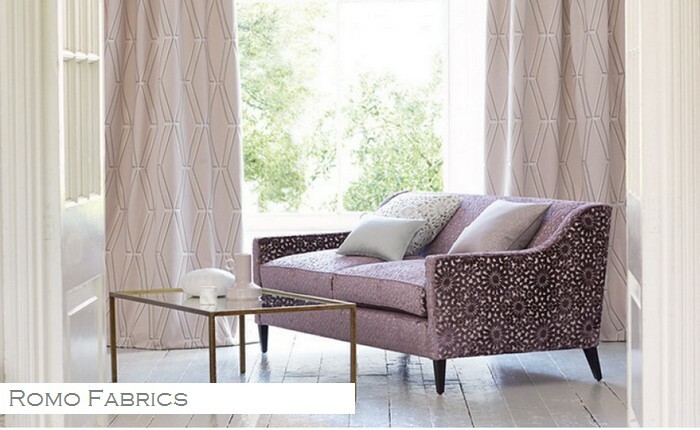 This collection exudes delicate femininity and an organic feel with a delicate touch of colour, subtle bluey greys, soft lilac and dusky pinks create the perfect link between design and colour. Artistic embroideries and textural printS bring a sense of grandeur to natural linen with a relaxed elegance in a diverse mix of designs. 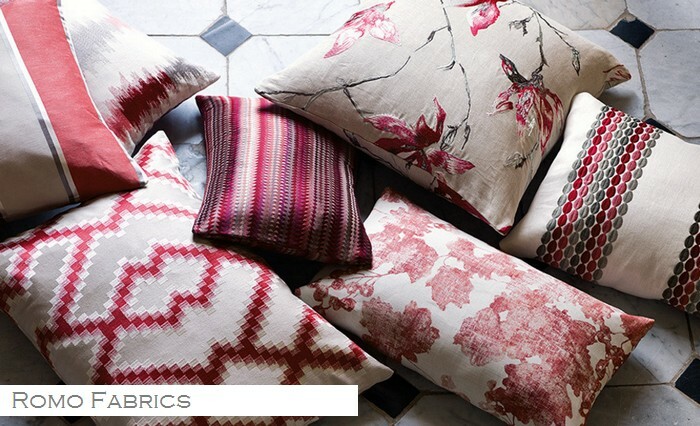 The collection features stripes and contemporary geometrics, as well as an oriental inspired and graceful distressed florals. In a palette of sophisticated colours; the ruby reds compliment muted greys and stylish shades of willow enhance the classic shades of ochre. A collection of 4 upholstery weaves with a natural feel and tactile quality, embracing an array of yarns from soft chenille to natural linen. 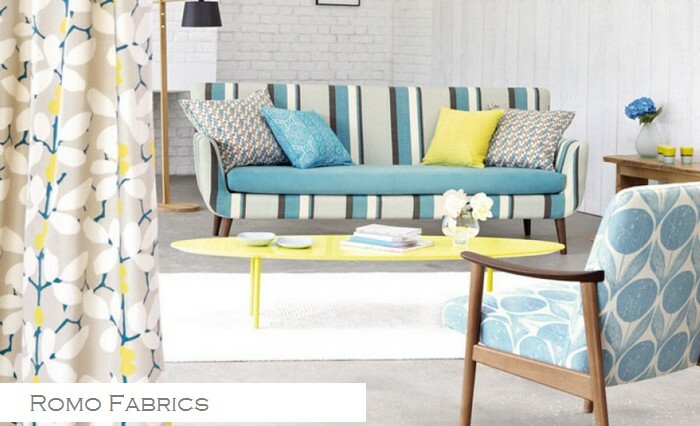 Elwin combines both an abstract and a small-scale geometric, a semi-plain and an appealing pattern. 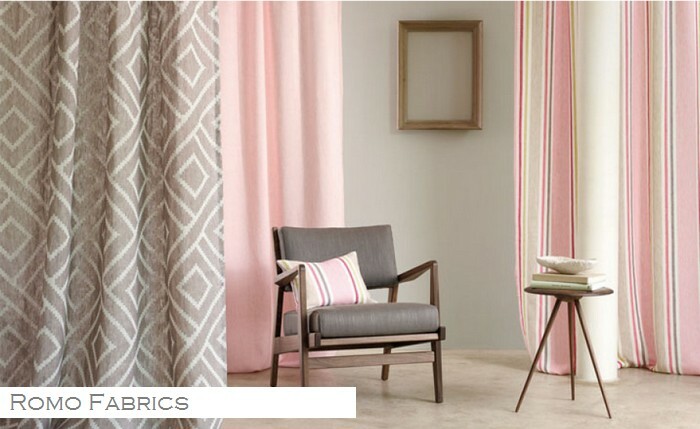 The palette includes neutrals, deep charcoal, moss greens, soft pink and burnt orange, these robust weaves are an easy care blend of modern colour and adaptable design. 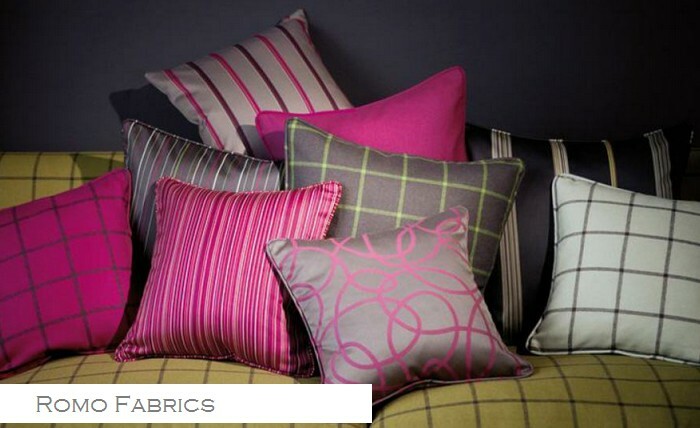 Inspired by haute couture of Saville Row Romo introduces colourful modern wools, featuring bright pinstripes and inspirational stripes, in colour combinations that are ground breaking and pack a punch distinct. 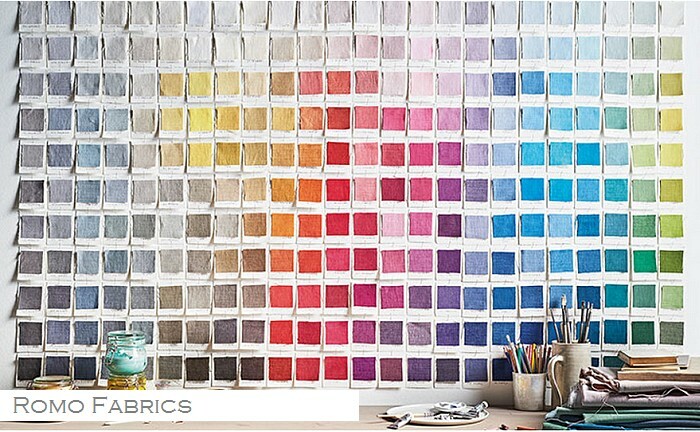 This fantastic wool collection is ideal for upholstered furniture, drapes and accessories. A bright summery collection of contemporary prints inspired by the Royal Botanical Gardens of Europe. Exotic florals, citrus shades and over-sized ferns with rambling floral trails convey the imperial style of country houses. 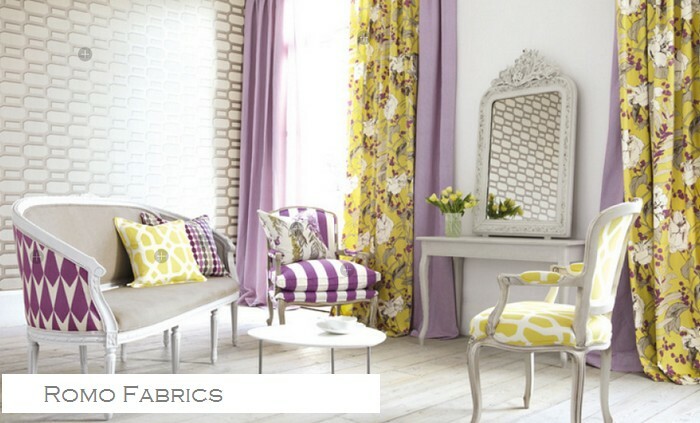 A glamorous fabric collection perfect for boutique hotels. Featuring large scale jacquard damasks and elegant ombré effect weaves in a stunning reversible silk damask. 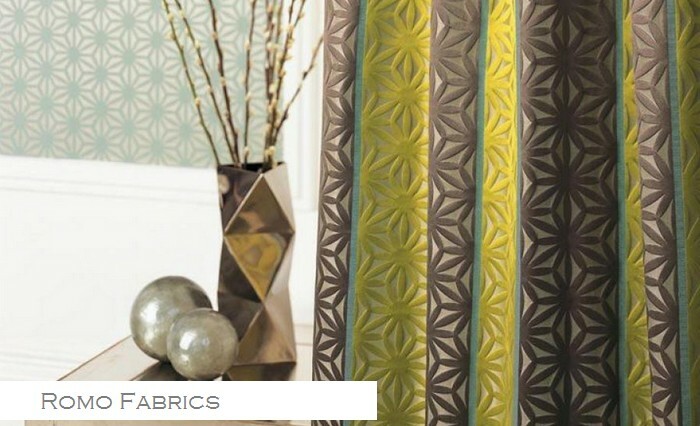 Eye-catching geometrics and 2 silk taffeta designs compliment this lavish collection. 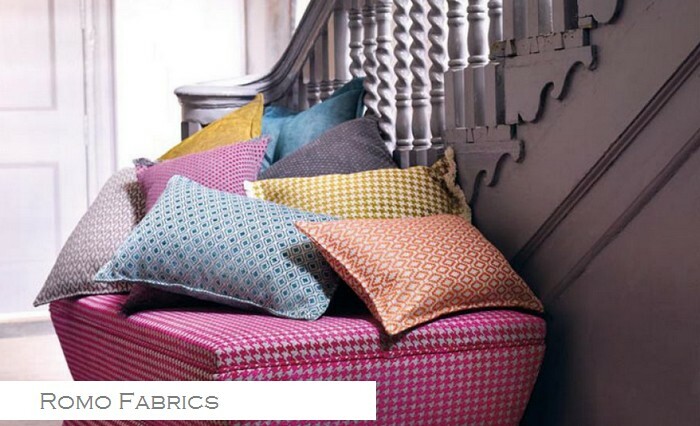 A collection of multi-coloured linen stripes and geometric patterns, in colourful combinations of ice-cream shades, calm neutrals and flashes of vivid but contemporary tones, all with a soft fluid handle to the fabric. 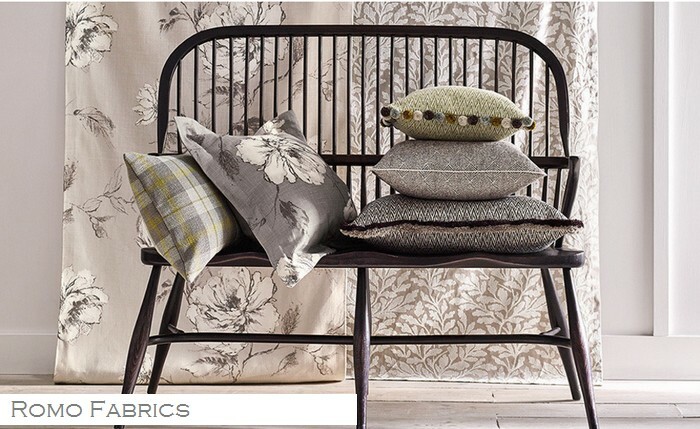 With a British stiff upper lip, the Kelso collection conjures up a picturesque country retreat and scenic woodland walks. 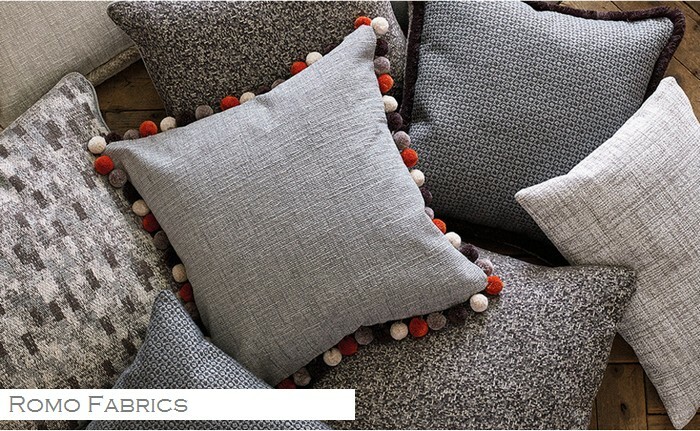 Comprising ten classic yet contemporary designs with a charming quality we suggest funky pom pom trims to add a sense of style. 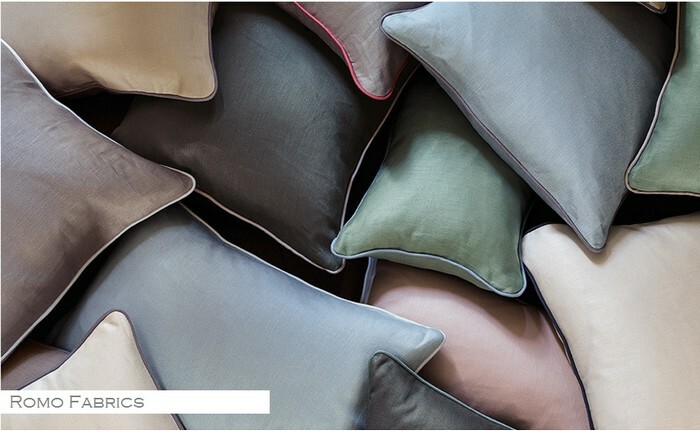 The colourways offer muted shades of soft grey, duck egg blue and pale green shades that instil a sense of heritage charm. Bright and contemporary colours in soft elegant shades are skilfully combined with neutrals and metallics to create striking visual effects. 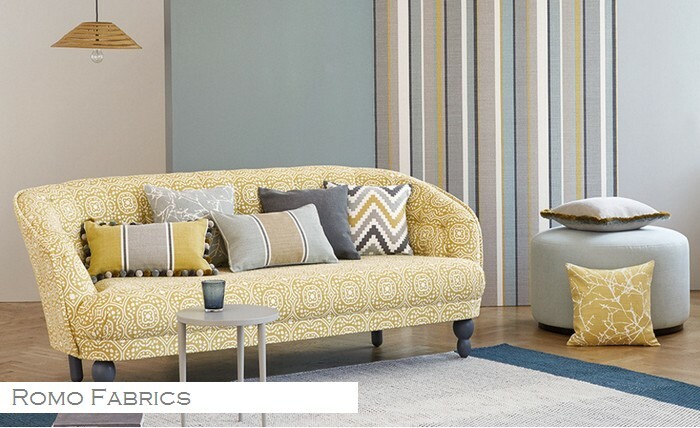 Be bold with this collection of stripes and small scale patterns, creating 3 varying designs in similar colour ways ... on to one piece of furniture. Four wonderful botanical designs beautifully stiched onto silk or linen fabrics, plus two elegant ombré effect stripes and a gentle paisley, finely woven from a luxurious 100% silk. Available in 7 stunning colourways. 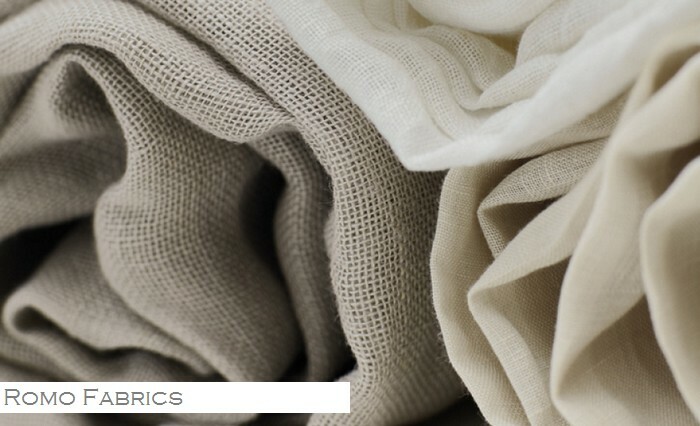 In a huge palette of over 360 shades, this is Romos best-selling gorgeous cotton-linen blend, Linara has a beautiful brushed finish with an exceptionally soft feel that adds a luxurious quality to this versatile plain fabric. 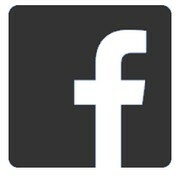 It is a washable linen which is the go to plain offering style and versatility along with practicality and durability. An intricately woven assortment that handsomely unites an elegant ‘tree of life’ design and tranquil floral damask with a hand embroidered effect. 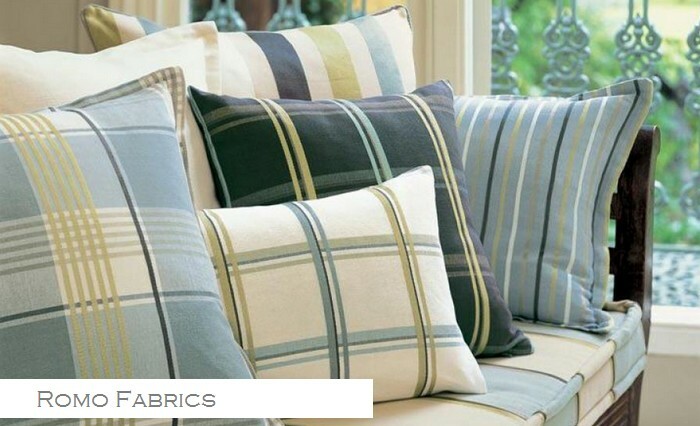 This lively selection of small scale weaves includes an ombre check, a herringbone stripe and original geometrics. A softly textured herringbone weave contrasts vibrant red with rich ebony and caramel neutrals to create a simple uncomplicated sfabric range. 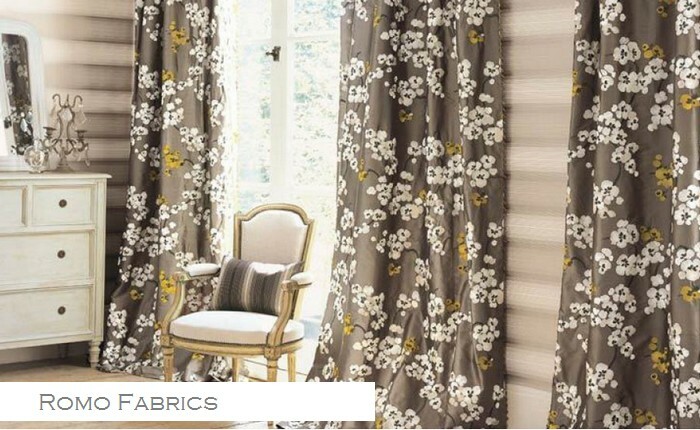 Ornare is a radiant collection of extravagant velvets and up-to-date jacquard weaves featuring florals, contemporary geometrics and timeless stripes with highlights of a luxurious metallic effect. A classic colour palette of versatile neutrals, sophisticated duck egg and graphite enrich the unique designs and faultlessly balance our other Romo collections. A diverse mix of ornate patterns from across the globe inspires this creative group of stylised floral and geometric prints. From the minimalism of Scandinavian block prints to the intricacy of intricate Moorish designs this timeless beauty of nature this is an exciting and innovative collection of versatile designs and colour combinations. 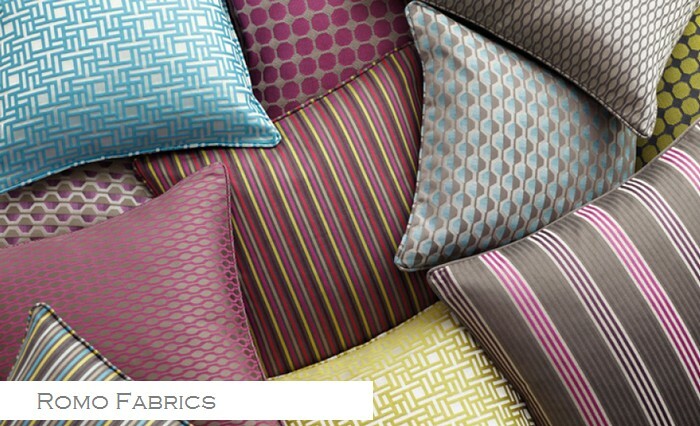 Romo introduces their decorative velvets incorporating gorgeous patterns with a riot of colour. 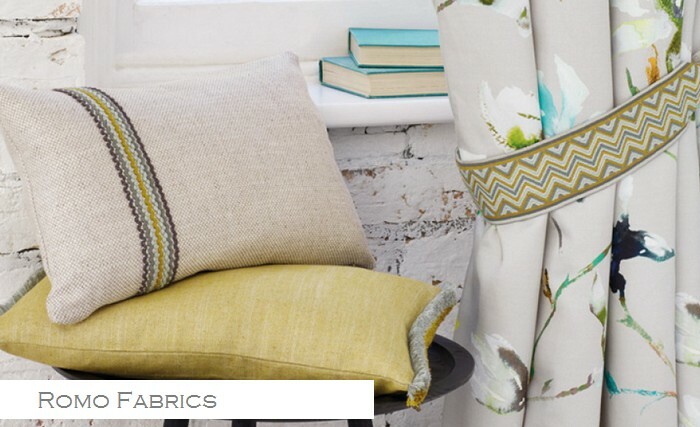 This fresh palette collection gives you entrancing small scale geometrics alongside distinguishing stripes and decorative weaves in dynamic multi-coloured options including rich pink, bright teal, emerald green and vivacious purple. 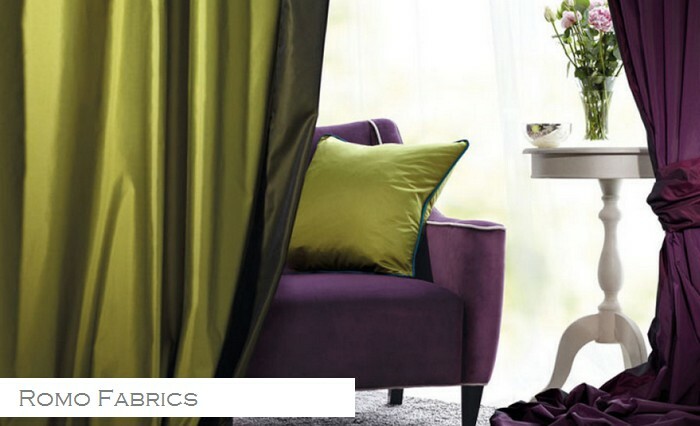 A plush viscose chenille, with a subtle random slub, in a selection of 52 daring and beautiful colours. 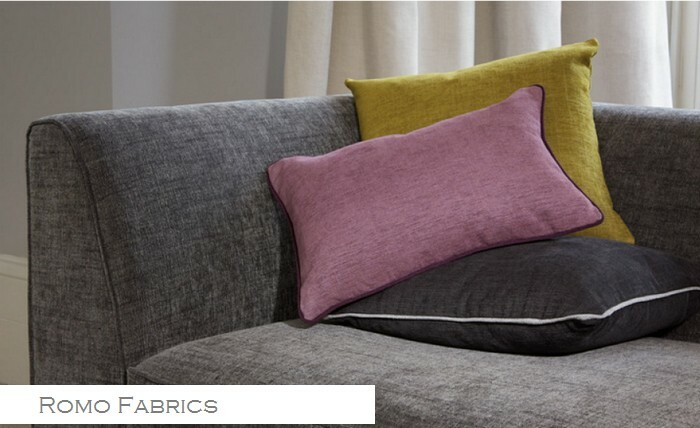 Perfect for upholstery this multipurpose plain fabric depicts a relaxed look with an element of textural luxury. A sophisticated linen satin presented in a delightful collection of practical neutrals and soft pastel shades, including wild rose, teak and glacier. A fine satin weave creates a pleasing elusive sheen bringing a touch of luxury to this sophisticated natural linen. 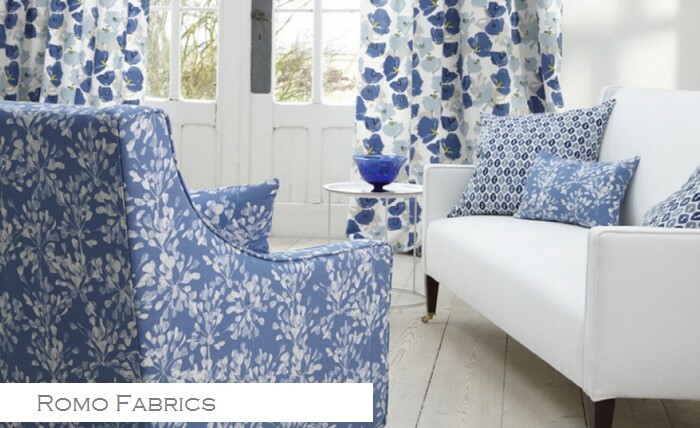 Saphira is a striking fashionable print collection that includes elegant, colourful blooms on an extravagant cotton-satin and a versatile cotton-linen. 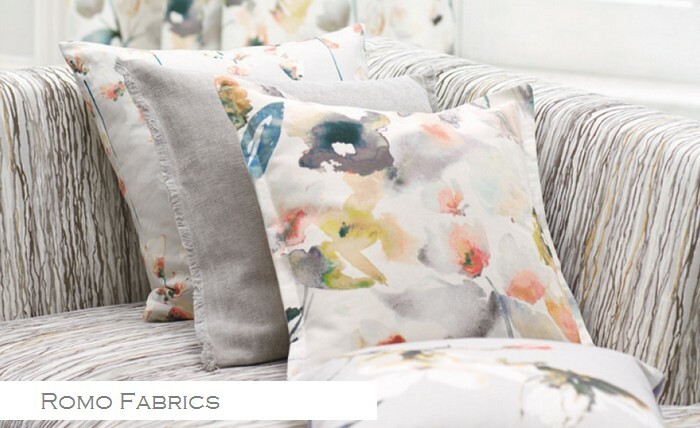 The delicate dash of watercolour forms a medley of hazy florals and eye-catching magnolias in a combination of colours. Flowing stripes interweave an array of hues and a lush viscose velvet features a combination of rich brushstrokes creating a stunning fabric. Two washable wide-width faux silks: one with the light, crisp texture of taffeta and the other with a smooth, supple handle that drapes beautifully. 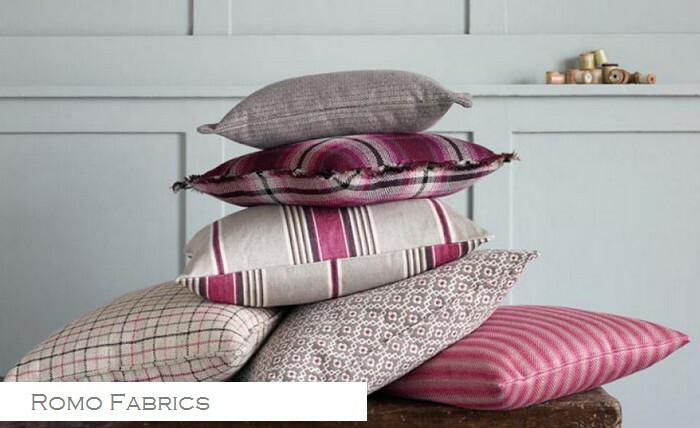 A colourful collection of simple checks and stripes, on cream and natural coloured backgrounds. 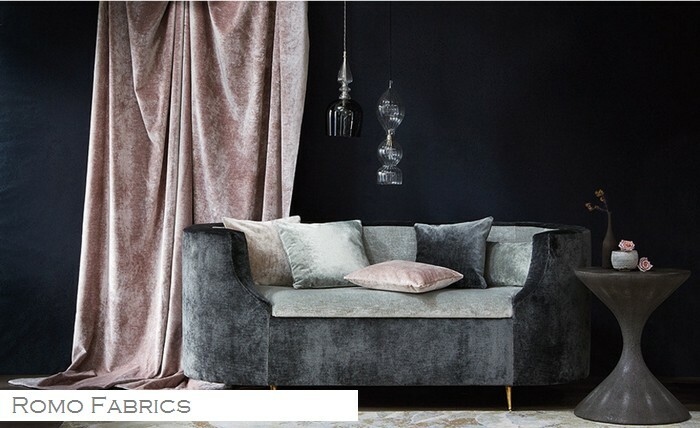 Extravagant velvet with a charming delicately dappled appearance given in a sophisticated array of neutral shades and rich tones. An appealing lustre and luxurious soft texture gives Tatiana velvet an added touch of elegance and richness. An ageless collection introducing 2 prominent checks and 4 smart stripes. 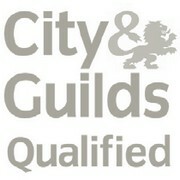 For ease of design it is teamed with 14 coordinating plain colours. Inviting, new combinations of Heritage Blue with Cactus and Shadow create a relaxed, fashionable interior for drapes, cushions and upholstery. Adding trimmings gives a unique look to your furniture. 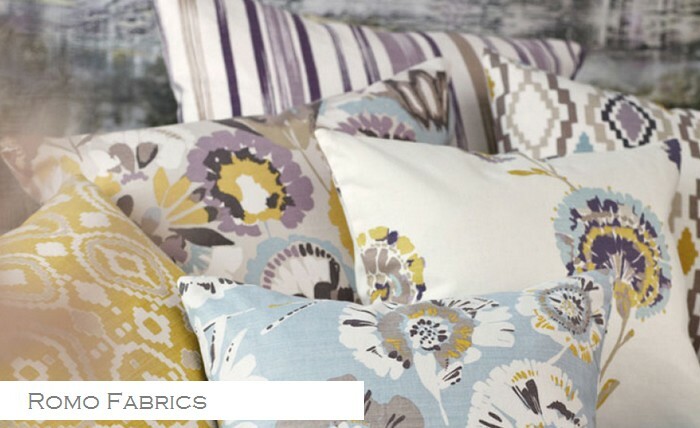 Our Romo collection includes innovative two colour fringe along with pom-poms, beads and lip cord that complement and co-ordinate perfectly with all new and existing Romo collections. 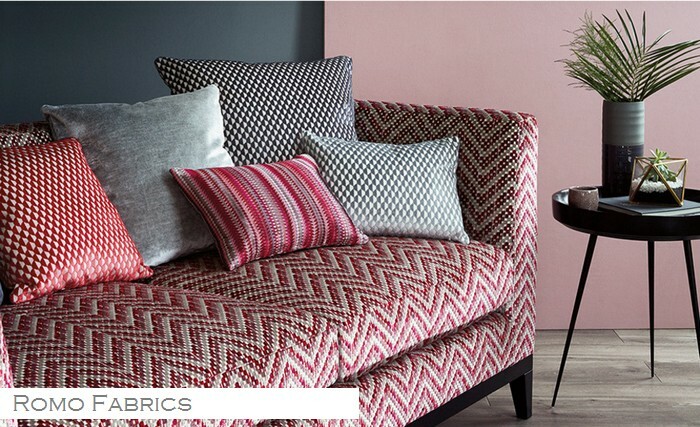 5 luxurious qualities feature in this new collection, comprising an eye-catching hound tooth, a herringbone chenille and 3 tempting small scale geometric designs. 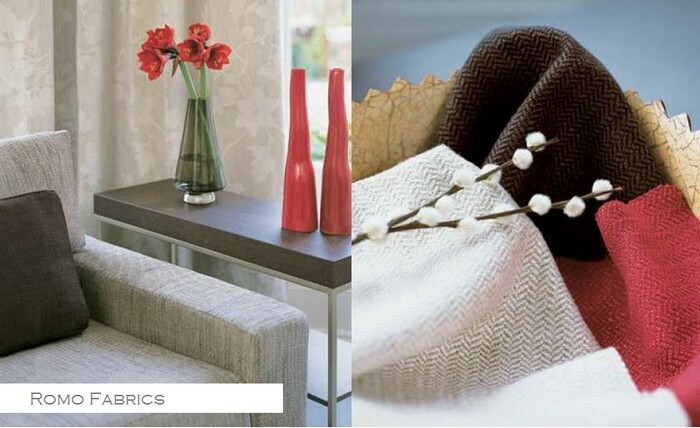 Offered in a remarkable range of jewel-like shades and classic neutrals, these genuine weaves are given a chic, modern feel. A collection of florals featuring an abundance of colourful blooms printed on a variety of cloths in light, random brush strokes. Distinctive geometrics in vibrant tints make a statement for upholstery in this outstanding collection of extravagant cut velvets. The collection features a stunning six colour stripe and three clever geometric designs in a range of energetic colours and elegant neutrals.